So you’re looking for some craft beer in Greenville, SC? Well you’re in luck! Greenville is literally overflowing with craft beer and breweries. So much so that I’m breaking this out into two lists. This one is all about non-brewery places that offer great craft beer. Want to hit up some breweries instead? I’ll be making another list of my favorites around town soon! Below are my favorite places to grab a great craft beer. Key word there is my favorite places. This is by no means an exhaustive list, but can be a great starting point for your own craft beer explorations. 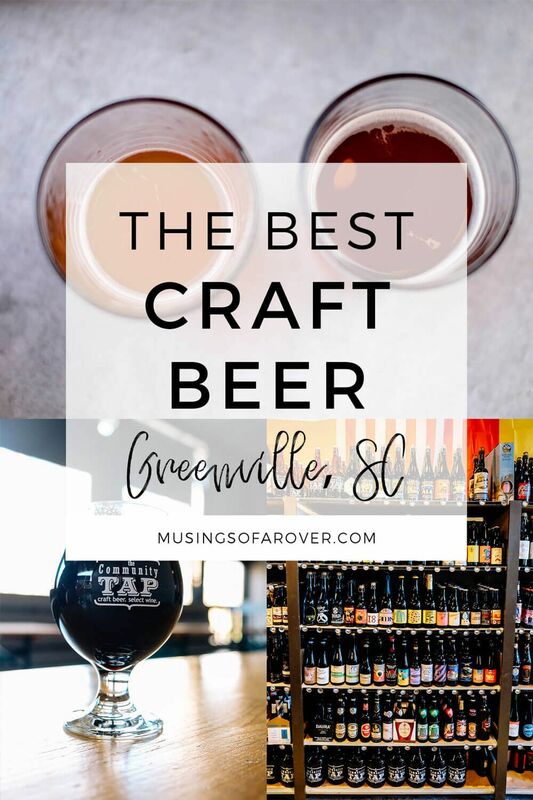 I’m toping this list with my favorite bar in Greenville. 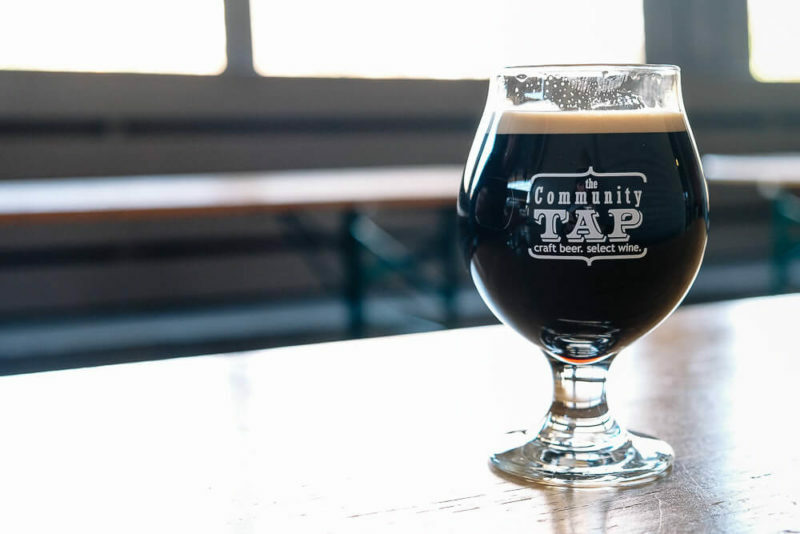 Community Tap’s located near the intersection of Stone Ave and Wade Hampton. It’s got friendly staff, amazing beers, food trucks (usually), games, and room for private events if you want to have your party here. And with literally like 20 beers on tap, I can usually find something that calls to me. Sometimes more than one. Don’t miss the back patio! On evening after work or a lazy Sunday, there’s a good chance you’ll find me here. Half great craft beer bar, half bike shop. Piney Mountain has a become a regular stop for me when I need my craft beer fix. They’ve got a big bar and some seating inside. Plus a back porch with lots of tables. There’s even a small bike track if you want to bring your bike. And even though there’s no food offered, you can usually find a food truck parked out front. Want to try just a couple of ounces of a ton of beers? Then it’s time to head downtown to Pour. Now Pour’s a little different than your average taproom. You get a wristband and a glass when you get there. Then the pouring is up to you! Simply go up to the taps, pick your beer, scan your wristband, and pour away! I love Pour when I’m in the mood to try lots of different things. I’ll pour myself a ½ glass or even a ¼ glass of each and try like 5+ beers. Each beer is priced differently but this is all clearly displayed above each tap. And if you want more info on any beer, simply tap the screen. If this sounds confusing, just ask the staff for help! Contrary to the name, you don’t have to just get growlers here. They have a full bar plus both indoor and outdoor seating. Located in the West Village, this place can be (sometimes) less crowded than others. Meaning I can find a seat without having to fight someone for it. The atmosphere feels super relaxed and they have a very large selection of beers on tap so your IPA fanatic and Rasberry Wheat loving friend can both find something to drink. They also do small celebrations as well so keep an eye on the calendar. (I’ve been to an Oktoberfest event here!). The outdoor patio area is covered and there’s lots of benches. Though if you’re here on a beautiful Saturday or Sunday afternoon, you may still have trouble grabbing a seat. They also have wine or non-alcoholic drinks on tap as well if you want something delicious sans beer. This hole-in-the-wall on a side street downtown is usually where I go when I want to buy craft beer in Greenville and take it home with me. They have a huge selection of beer (both local and international) and I love that I can get just 1 bottle of so many different kinds of beer. But they do have a few taps and tables as well if you want to kickback for a drink. Be warned though that the place is small inside if you have a big group. Barley’s has some of the best pizza in town. I love it. And if you’re downstairs they have a HUGE beer list with tons of brews available via draft, bottle, or can. But Barley’s upstairs has a special place in my heart. Huge bar with lots of different beer options? Check. Darts, pool tables, fuseball, and shuffle board? Check. Barley’s is where I tend to go on a weekend night when I’m downtown when I want both a craft beer and a chance to play some games. I find it’s great for groups since the space is large and doesn’t feel packed (even when it’s quite full). Plus great pizza downstairs if you’re hungry (though the downstairs does close earlier than the upstairs!). I know what you’re thinking. But Sidewall is a pizza place! And yes, yes it is. But they usually have half a dozen or so great craft beers on tap as well. Plus with more locations popping up all the time, heading into sidewall for your craft beer fix may be the closest option. And don’t forget the pizza! (My personal favorite in town.) I love just grabbing a seat at the bar, ordering a couple of beers and a pizza as well. It’s very relaxed and I love the atmosphere. This was a recent find for me, and I was shocked I had never heard of it before (especially considering that I live quite near to it). Tucked down Poinsett Highway (kind of in between Lowe’s and Publix), Red’s is a huge bar. Like literally the place is enormous. They’ve got games, a giant floor for events (my team recently held a moving showing there), and friendly staff to help you pick out a beer. They’ve got 10+ beers on tap plus more in bottles and cans in case the drafts don’t call to you. The only thing I didn’t like was the tiny parking lot. If you’re coming with a big group, definitely consider car pooling. Coffee shop by day and craft beer place by night. That’s Grateful Brew! And with lots of tables, games, and food trucks, this is a great night out without having to head downtown. Stay tuned for my brewery breakdown! I’ll add a link here once I make it. Don’t forget to check out my full guide for Greenville if you’re looking for things to do, places to eat, and more! Looking For The Best Pizza In Greenville SC?